South Korea is still watching how negotiations between the United States and North Korea are going to determine whether President Moon Jae-in should fly to Singapore to join US President Donald Trump and North Korean leader Kim Jong-un in declaring an end to the Korean War, an official said Monday. The possibility of Moon traveling to the Southeast Asian nation gained traction after Trump said last week following a meeting with senior North Korean official Kim Yong-chol that his June 12 summit with the North's leader could include formally ending the war. 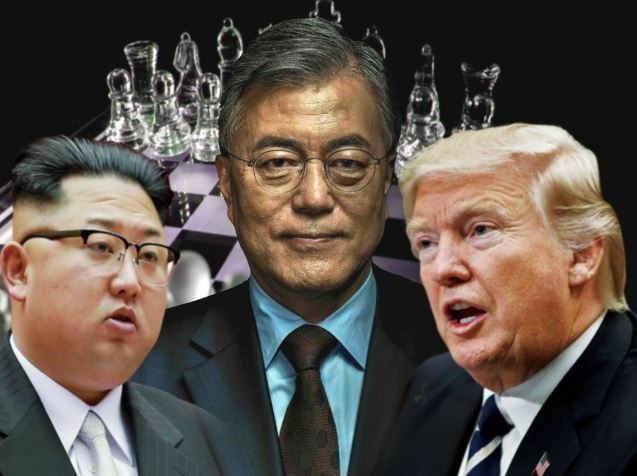 Should the US and the North agree to use the summit to declare an end to the 1950-53 conflict, Moon would have to travel to Singapore to join them. The Korean War ended in a truce, not a peace treaty, leaving the divided peninsula still technically at war. But a presidential official said no decision has been made yet on Moon's possible trip to Singapore. "It's not that our government has entered into full-fledged preparations to join the North-US summit," the official told reporters. "We're keeping an eye on negotiations between the North and the US on the agenda."